Hermann Levi studied in Mannheim and from 1855 until 1858 in Leipzig. After various trips that took him e.g. to Paris, he accepted an appointment as music director in Saarbrücken, before he moved to Mannheim in 1861. From 1862 to 1864 he was chief conductor of the German Opera in Rotterdam and then worked at the Grand Ducal Court Theatre in Karlsruhe. 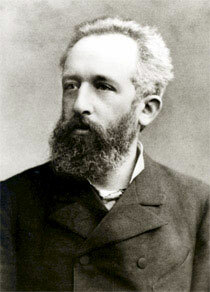 In 1872 he was appointed general music director and Kapellmeister in Munich. Due to health reasons he retired in 1896. He is one of the most important conductors of the 19th Century. He conducted the premiere of Parsifal in Bayreuth in 1882, allthough he refused to convert to Christianity as he was asked by Wagner. According to King Ludwig II.’s request, he kept the conduction of the premiere. After Wagner's death in 1883 he was good support to Cosima Wagner. He, however, rendered outstanding services to Mozart, Brahms and Schumann. He, for example, introduced the Mozart opera cycle into the German opera repertoire and translated the libretto of Le Nozze di Figaro by Lorenzo da Ponte. Clara Schumann met him in the summer of 1863 in Baden-Baden and appreciated him a lot. She performed several times in Karlsruhe and Munich under his conduction, including Schumann's Piano Concerto. Levi admired her as motherly friend. When Clara Schumann spent the summer times in her cottage in Lichtenthal near Baden-Baden, She often went with her children to the theater in Karlsruhe. Levi often visited Clara Schumann, sometimes accompanied by Brahms and the photographer Julius Allgeyer. The conductor touchingly took care of Ludwig Schumann, provided him in October 1865 with an apprenticeship in the Braun bookstore in Karlsruhe and even wanted to accommodate him. In 1868, he rehearsed Schumann's Genoveva in Karlsruhe, and Clara, who came to see the performance, considered it "extraordinarily beautiful". In Munich in 1873 he earned great success with Manfred with Ernst von Possart in the title role. Eugenie Schumann described him as very lively and spirited as well as a very good conductor, who was able to inspire his musicians. Over the years, a friendship with mutual appreciation between two artists has developed, but Levi's increasing enthusiasm for Richard Wagner caused a gradual alienation of Clara Schumann. The contact persisted nonetheless and Clara even offered her condolences after Wagner's death. Although Levi already mentioned a gap between the two of them in 1886, he greeted Clara in rememberance of former times in love and affection. After a surprising visit, Clara noticed in 1890 that she doesn’t not have any amicable feelings for him anymore, since he did not ask after Brahms and did not know about latter’s recent works. Still, she continued the friendship until her death.